Thanks- enjoyed it, as always. hope a made sense with my take on this one... Blessed Sunday everyone! 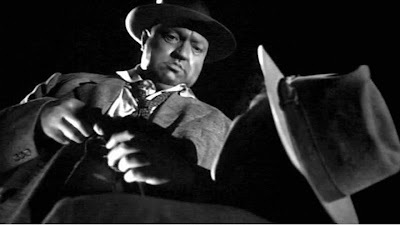 Orson Wells...one of the great actors...they don't make 'em like him anymore. Have a great Sunday everyone!! Just where did you find this outstanding image? This was fun.....! Oh, man, I'm still having linking problems. When I click on my name, I get blocked. No solution yet. I hope some folks will drop by my blog Savage Reflections anyway. pooey- no wonder I cannot get onto your blog! My sympathies - hope it gets solved soon! I have input another linky on your behalf, at No. 36 - I think you'll find it works fine! don't forget to add the photo credit/source! I left off the photo info so Maggers wouldn't be swayed by the film title, etc. My entry tells the true tale of when I first saw this film as part of an Orson Wells double bill at the Nostalgic Theatre in Toronto. Wow! I made it - two Sundays in a row. I'm up. What a great shot for a prompt. .. and they say perception is reality. This is somewhat different- Be back later to visit! Thank you, Tess!!! This fit perfectly with the wordle...for me anyway!! Smiles all! Thank you the emotive image today. Thanks Tess - interesting image. If I can get my mind out of the gutter, I'll try to write for this. But you do not want to know what I'm envisioning. Tess, I really like this image. But it led me towards something another direction ....and away from Orson Welles! Well, if I could have splattered my page with blood I would have. Blogger has its limitations however. Put me in mind of old school gangster stuff. Not a fan of Welles or 50's films but the prompt actually took me straight to British Comedy duo Hale and Pace who made a parody of similar. And I have to stick with my first thought! I had fun with this one. Thanks! I have changed the first line of my Mag because there were two of us on the same page. My "Buddy" is now "Sugar lips" which given the write, is more appropriate! Hi Tess- I am a little late and have read none of the others (which may be a bit dangerous), but looking forward to them. Hope you are well. k.
Love, love old movies and their awesome one liners! Thanks, Tess. Don't you just love bullies - on film, in books? No? Neither do I!